O.k everyone has some kind of fetish in life, some kind of thing that is just their thing, it's just what they do. Some people love crafts, dining out, flowers etc.... Well, my love in life is shoes, yep shoes. love em' So ever since we moved into this rental, we have a small closet, and besides the fact that I moved my "summer" shoes into a tub in storage, the closet just still can't hold all my shoes. I have been threatening Brandon that i was gonna go buy a shelf to at least fit half of them, i was just so tired of all the shoes all over the closet floor, and it made it soooo difficult to find the mate to the shoe you wanted, our prime reason for being late to church! Being the handy man Brandon is, he just doesn't buy whatever he can build himself, and he gets a kick, as well as an ego boost when he does build it.So, Because it was a holiday yesterday Brandon didn't have school, and he was so nice to opt out of working and spend the day with us. it was very nice and much needed. Well, after a trip to Lowe's he was off to the saw and the measuring. He let me peek a few times and it was looking pretty darn good. i was assured this would work out. after Brandon informed me there were over 73 pairs of shoes, not including my tub in the basement, i knew i had to take charge here and part with some of my collection. I mean honestly, who wears 75 pairs of shoes, well i do, just not on a regular basis. So, after a lot of thought and consideration, i picked out my favorite pairs and put the rest in a sack for goodwill. the sack is actually still sitting just outside by bedroom door, just in case i change my mind on any! I will be strong. 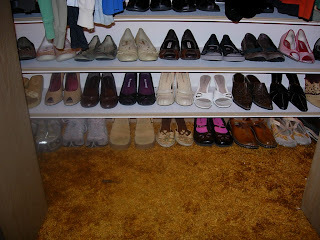 well, after Brandon got done, this is what our fabulous shoe shelf looked like. Sorry, you can't get the full affect. the closet is quite long, the doors just aren't wide, dang it. Well, i was impressed, but Brandon insisted we return to Lowe's he needed another shelf and a few more things, so we headed out. after he locked himself in our room for a bit longer, he once again let me in for the finished project. Now, when i first saw the shelves, they were just like this, but when i went in again, the doors were shut, funny i thought, but oh well. so he stood back and said go ahead, pull them open and take a look. well, i opened that closet door and WHAM! I stepped into wonderland! 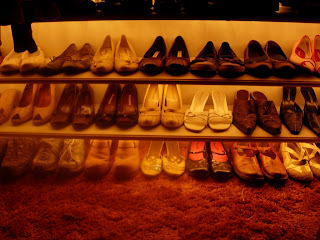 Yes, all you shoe lovers out there, this is a LIGHTED shoe shelf! Brandon ran lights under the shelves so every time i open the closet, my shoes light up, for a quick find of course! This picture was taken with the lights off, but it is still awesome with the lights on, and the best part, it's a motion sensor, so every time i open the doors, Bing! lights on! ready to choose. Isn't my husband awesome? This is soo cool for someone who loves shoes! Today I sat in front of the doors and kept opening and closing them, just to watch the lights, so cool! I love my hubby, and his ability to build fantastic stuff, saves us money, and brings out creativity, love it! love it! love it! These pictures hardly give it justice too, so my closet is open to whoever wants to indulge their fetish of shoes as well! WOW, that is impressive!!!! What a great hubby. Oh, yeah, my hair is AWESOMEAWESOMEAWESOMEAWESOME tonight! My ballast has been out in my closet for a couple months... you get shoe lights and I don't even have lights. I'm do JEALOUS!!! We share the same fettish though. It's embarrassing how many shoes I have, but alas, I have no lights, my shoes are left in the dark. I got your message a day or two after you left it....I'm pretty sure it was when we were on vacation. 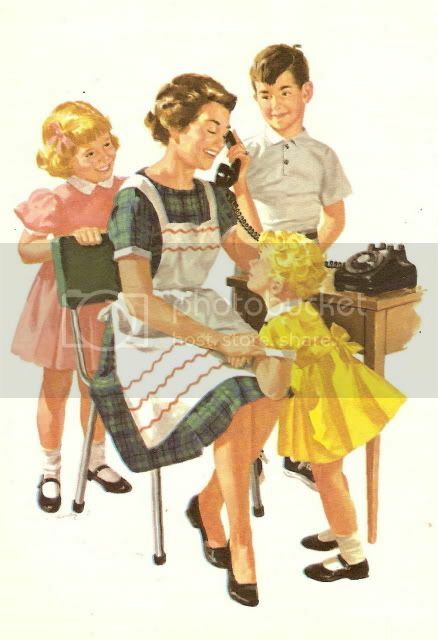 Please call again. I would love to help out. Pretty impressive, I must say! Even if I don't share that kind of love for shoes I am still impressed.